Sound recording was invented in 1877 by Thomas Edison. For the following 2 decades the media on which sound was recorded and reproduced was the Wax Cylinder, and later Celluloid Cylinder. The trouble with the cylinder format was that it was difficult to mass produce, wax cylinders were fragile, took up a lot of storage space, and were, because of the cost intensive manufacturing process, somewhat expensive. What Emile Berliner did was to invent a system of recording on flat discs from which a matrix could be made, and from which many copies of the original recording could be cheaply pressed. Berliner patented his invention that he called the gramophone. The transition from wax cylinders to the flat disk gramophone was a pivotal moment in the history of recorded sound. Berliner founded "The Gramophone Company" to mass manufacture his sound discs (records) and the gramophone that played them. To help promote his gramophone Berliner persuaded popular artists to record their music using his system. Born in Germany May 20, 1851, he first worked as a printer, then as a clerk in a fabric store where his talent as an inventor came to surface. He invented a new loom for weaving cloth. 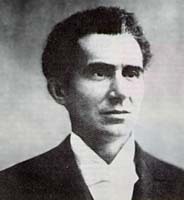 Emile Berliner emigrated to the United States in 1870, following the example of a friend. He was very interested in electricity and sound and spent much of his time at the library of the Cooper Institute. After seeing Alexander Graham Bell's very first telephone (consisting of two identical cases containing an electro-magnet and a diaphragm connected by an electrical circuit) during the Philadelphia exhibition, celebrating the 100th anniversary of the American Revolution in 1876. Berliner noticed that the invention had a good receiver but a poor transmitter that made the message sound very unclear. Berliner began to research how to make a better transmitter. He built and installed a telephone between his apartment and his landlady. Berliner experimented and found a way to build a better transmitter for Bell's invention. Berliner's discovery was patented on June 4th 1877, in essence what we know today as a microphone. In September 1877 the Bell Telephone Company of Boston paid Berliner for his invention and employed him. In 1883, he resigned and returned to Washington. He moved to a house on Columbia Street and set up a research lab there. It was there that he invented his gramophone (patented 1887), flat records and a system for pressing records. Berliner's gramophone was displayed for the first time in 1888, at the Franklin Institute of Philadelphia. It was at this time he began to manufacture records. He invited musicians to record on zinc plates. In 1890, Scientific American published an article about his invention, illustrated by engravings of his gramophone and the machine that recorded the sound. Berliner made a trip to Germany 1889-90 and arranged for the first gramophones to be manufactured. It was in fact first manufactured as a toy, by toy makers Kämmer and Reinhardt in Waltershausen (Thuringia) . These were small hand-propelled gramophones, as well as a talking-doll. For the doll, a small 8 centimeter (just over 3") disc was made, and for the regular machine a 12.5 centimeter (just under 5") disc was made. The gramophone was first commercialized in the USA in 1893 by the 'United State Gramophone Company' a company founded by Emile Berliner and some of his friends. In the fall of 1895 a group of businessmen in Philadelphia put up $ 25,000.00 to set up the Berliner Gramophone Company. Emile Berliner was a minority stock holder and the copyright for the patent belonged to the company. Sales of the hand wound gramophone were lower than hoped and the company was quick to understand the need to improve the gramophone, particularly to equip it with a spring or electric motor. Eldridge R. Johnson was a machinist in Camden, New Jersey and he created a motor for Berliner Gramophone. Between 1896 and 1900 almost 25,000 motors were produced. The Berliner Gramophone Company, lacking marketing acumen, signed a marketing contract with Frank Seaman of New York. Emile Berliner's invention was now in the hands of three companies - The Berliner Gramophone Company (Philadelphia) who manufactured gramophones and records, The Seaman National Gramophone (New York) who oversaw advertising and marketing, and the United States Gramophone Company (Washington) who held the patents. In 1898, Eldridge Johnson received patent 601,198 on his gramophone March 22, 1898, filed Aug. 19, 1897. It was a very important patent that effectively launched the disc talking machine in America. Early in 1900, Seaman's National Gramophone negotiated an agreement with American Gramophone and Columbia Phonograph to manufacture the 'Zonophone'. Berliner saw this agreement as a betrayal in view of the exclusivity contract he had previously signed with them. There were various disagreements between Berliner & Seaman, and on June 25th 1900, Seaman filed an injunction against Berliner Gramophone which effectively prevented Emile Berliner from selling his gramophone in the United States. As a result of these problems, Berliner moved his company to Montreal, in Canada. Montreal was probably selected because of the ease of railway transport between there and Philadelphia. Johnson was able to sell his own machines through his Consolidated Talking Machine Co., and managed to defeat Frank Seaman in a patent dispute. Johnson created the Victor Talking Machine Co. in 1901 and joined with Columbia to create a disc monopoly. The 'Berliner' and 'gramophone' names disappeared in the United States and were replaced by Victor and the Victrola. Between 1904 and 1906, the Berliner Gramophone Company produced several types of gramophones at the Montreal factory, but the real business was happening in the USA with other people capitalizing on Berliners invention. In 1924 the Berliner Gramophone company was bought by Victor Talking Machine which merged in 1929 with RCA to become RCA Victor. Emile Berliner died August 3, 1929 after a heart attack.